"My grandmother use to make this for my grandfather. She passed the recipe down to my mom who use to make this for our family, but especially for my father who absolutely LOVED this! I now make this for my husband! I serve this with buttered corn and smashed garlic potatoes!" In a bowl, stir together 1 cup flour, 1 teaspoon salt, white pepper, and garlic powder. In a separate bowl, beat eggs with garlic and parsley. Dredge each tenderloin fillet in seasoned flour, dip in egg mixture, and dip back into flour mixture. Shake off any excess flour. Gently place the steaks into the hot oil, 2 at a time, and cook until golden brown on both sides, about 3 minutes per side. Drain on paper towels. Place the sausages in a small skillet over medium heat, and fry them until very dark brown on all sides, about 10 minutes. Finely chop the sausages, and set aside. In the same skillet, melt butter, and stir in 3 tablespoons of flour. Cook the butter-flour mixture until it turns a pale beige color, about 1 minute, then stir in the sausage, cream, salt, and black pepper. Bring the mixture to a simmer, and cook until thickened, about 5 minutes. Serve sauce over the fried steaks. 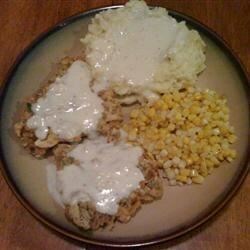 See how to make real Southern-style chicken-fried steak with creamy gravy. This was super easy and fast. I didn't make the gravy because of time but the chicken fried steak was really good.